Kristen Lorello is delighted to announce Milan-based artist duo Goldschmied & Chiari's second solo exhibition at the gallery. The exhibition debuts an exciting new body of polychrome photographs of smoke, printed between transparent and mirrored glass. Vice Versa marks a deepening of the artists' exploration of colored smoke as the starting point of distinctly reflective objects. 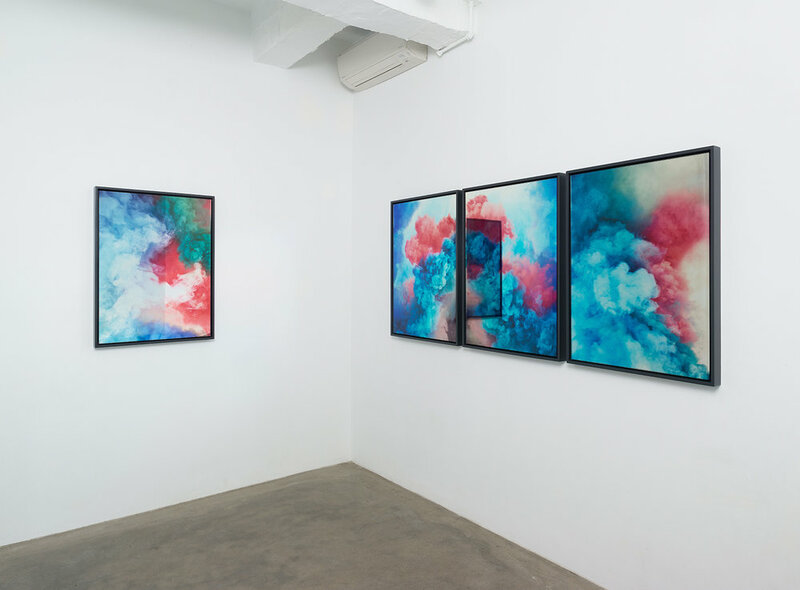 An initial action of igniting and photographing multiple smoke flares, gives way to depictions of transforming vapors, disguised as cumulous clouds and transparent washes of color. 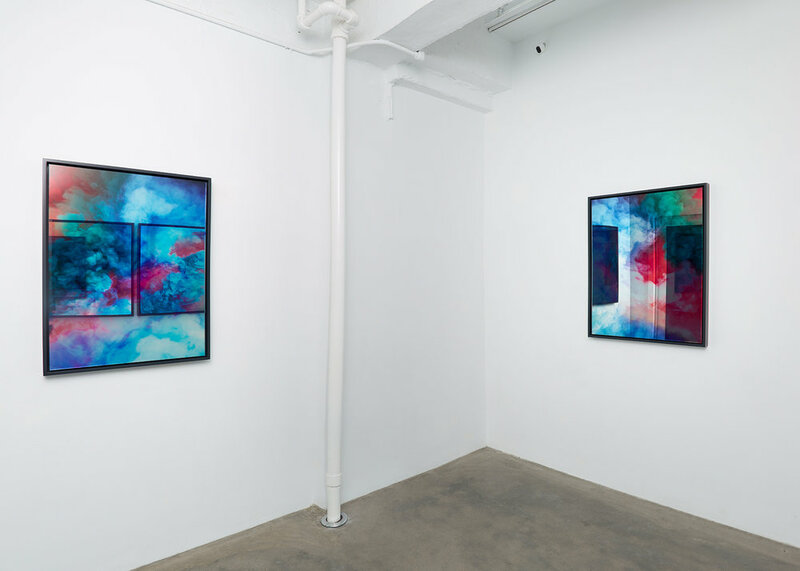 Printed onto mirrored glass, when installed within the gallery, the works overlay architecture and image, dissolving the boundaries between picture, surface, and site. These blurred distinctions recreate a sense of the artist's original gesture in the studio, when they temporarily transformed interior space into a swarm of clouds in artificial colors. Each of the new works develops from the artists' previous gallery exhibition Untitled Portraits, towards an enhanced visual presence of the smoke. 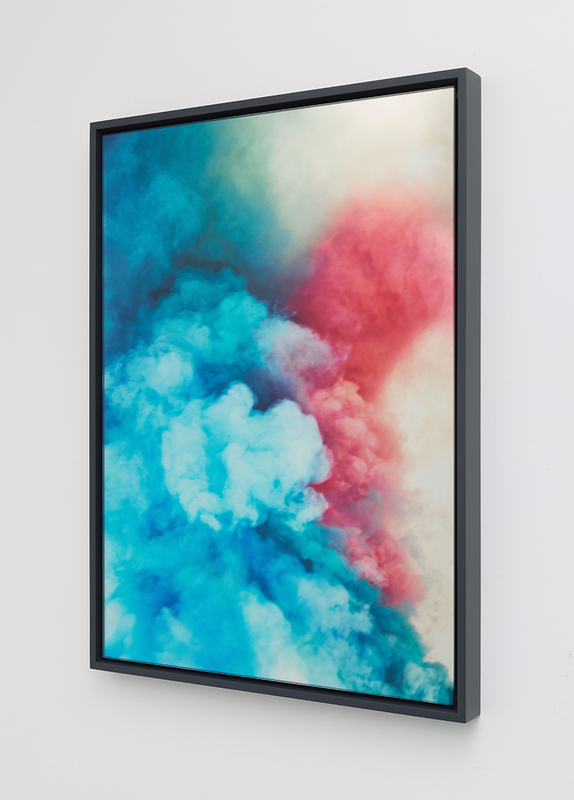 The artists have conveyed highly saturated vapors as mobile, dense, and active, in a nod to the use of smoke flares as signals of urgency and protest. Slick surfaces reveal clouds of colors hovering, expanding, and streaming up into the air. Goldschmied & Chiari (Sara Goldschmied, b. 1975, Arzignano, Italy, and Eleonora Chiari, b. 1971, Rome, Italy) have been working together since 2001. Their works are included in numerous collections including, the Castello di Rivoli, Turin, Italy, the Fondazione Sandretto Re Rebaudegno, Turin, Italy, MUSEION, Bolzano, Italy, FRAC Brétagne, Rennes, France, LIMAC, Museo de arte Contemporáneo, Lima, Peru, The Capital Group, Los Angeles, CA, and the Maison Bernard Anthonioz, Paris, France, among others. The 2016 monograph, Goldschmied & Chiari: La démocratie est illusion documents the eponymous exhibition curated by Etienne Bernard, at the Centre d'art contemporaine passerelle, Brest, France in 2014, which traveled to the Villa Croce, Museum of Art, Genova, Italy, curated by Ilaria Bonacossa. Recent exhibitions include Untitled Views, Renata Fabbri Arte Contemporanea, Milan, Italy (solo exhibition), 2017, Corpo a Corpo, curated by Paola Ugolini, Galleria nazionale d'arte moderna, Rome, Italy (group exhibition), 2017, Historicode: Scarcity & Supply, curated by Lu Peng and Letizia Ragaglia, The 3rd Nanjing International Art Festival, Baijia Lake Museum, Nanjing, China (group exhibition), 2016, and "Organic Matters: Women to Watch," National Museum of Women in the Arts, Washington, DC, (group exhibition), 2015. Goldschmied & Chiari will be included this November in the special project, Deposito d’Arte Italiana Presente, curated by Ilaria Bonacossa and Vittoria Martini, at the Artissima Art Fair, Turin, Italy.